Yet again New Orleans Ice Cream company has delivered another free pint of ice cream excellence. You know me, I don't just say something is good because it was free. I mean it here. Just you just wait and see, they'll be spreading across the country before you know it. I see big things in New Orleans future. I like the artwork, definitely makes it feel "limited edition", though I don't think it is. 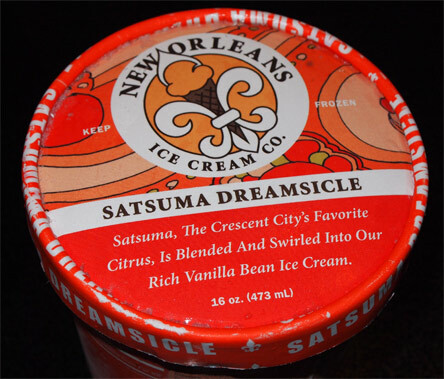 As with all the other flavors, the cover happily informs us that Satsuma is New Orleans favorite citrus. Wiki basically says Satsuma is a sweet mandarin orange with a thin skin. 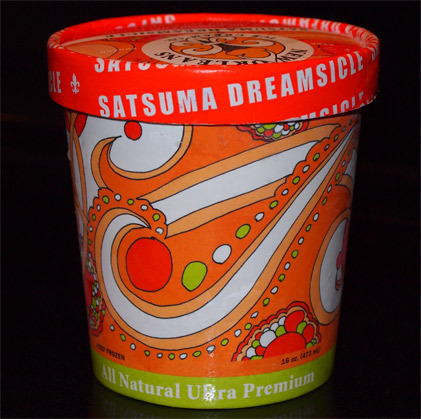 It also says that Satsuma refers to the Japanese province where many believe the fruit originated. Ok, enough learnin' - I'm hungry. Ok, I'm already a few bites in and this is a really nice flavor. 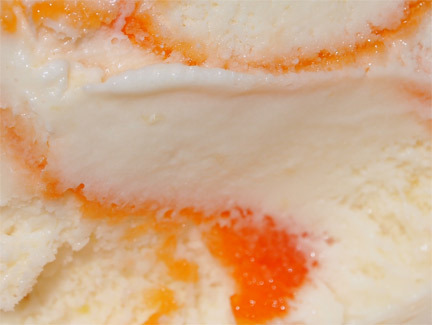 I tend to think orange creamscilce is more of a novelty and not so much a regular flavor, but there is something special about this version. There's a smoothness to ever bite that is really drawing me in. It's almost a buttery feel to the base and it's knockin' my sox off. It really nails that filling in a creamsicle and I am impressed. The orange swirl has is a little icy (almost gritty?) in contrast to the smooth base. 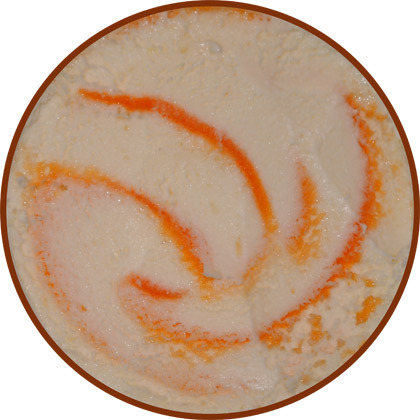 The swirls are literally everywhere yet their flavor is still gentle. I try to scoop around it to test the base but its just not going to happen. It's funny because you literally have the base being the creamsicle filling while the swirl mimics the orange creamsicle coating. Too funny. Here's a close up of the icy swirl. Now if push comes to shove, yeah, I could probably do with less of it but it's only because the base is so darn tasty (though what would it be without the swirl?). Iunno, it's orange goodness and that's a nice thing for someone who hasn't had his orange juice in like a month. Not sure how else to say just how nice this is (I swear I can't write a decent sentence right now). It seems everyone tries to knock off the creamsicle flavor at some point but this is an homage, a wonderfully soft and encompassing homage. I was hoping I'd like it and boy do I. I could easily plow through the whole pint, but you really need to slow down and let every bite melt on your tongue. Mmmm, let the flavor flow. So soft, so smooth, so incredibly tasty. I love when you aren't sure about a flavor and it just comes out and hits a home run. No tart here, just sweet pleasant goodness. On Second Scoop: Yeah, I really like this ice cream. It's exactly what a summer flavor should be: FUN! It's the uniqueness of a creamsicle but with added awesomeness of being an ice cream. It's totally one of those flavors were you go "Here, ya gotta try this!". The texture is the perfect match for the flavor, and it's just all smiles on this one. Nice job on this one, it's a perfect summer flavor. Second Opinions: Crazy Food Dude seems more unsettled by the texture of the funky swirl. I had already typed my review (not posted it yet), but it seems like it is almost verbatim from yours (I even linked Wikipedia). Just so I'm not fully a copycat, I'm posting mine this afternoon. Just know that I didn't plagiarize! hehehe, too funny, but no worries, I trust ya. I've been purposely not reading the other new orleans reviews so i don't inadvertently swipe an idea either.